825 pages | 27 Color Illus. | 67 B/W Illus. 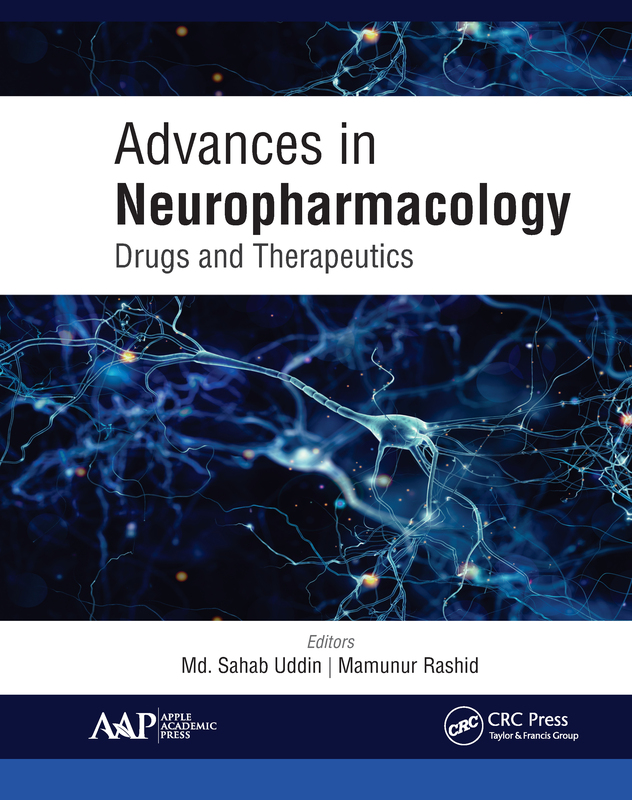 This new volume, Advances in Neuropharmacology: Drugs and Therapeutics, provides a comprehensive overview of the drugs that act on the central and peripheral nervous systems. It thoroughly describes the diseases that are associated with the nervous system and drugs used their treatment while also looking at the current status of these drugs and their future potential and challenges. This book is divided into three sections that describe the nervous system associated diseases and their treatment as well as current status and future opportunities and challenges. Section 1 focuses on the drugs that affect the functions of the autonomic nervous system to produce therapeutic effects. These drugs may act presynaptically by manipulating the genesis, storage, and secretion, and by blocking the action of neurotransmitters. Some drugs may trigger or impede postsynaptic receptors. Section 2 focuses on drugs that affect the central nervous system, including antianxiety drugs, sedative and hypnotic drugs, antidepressant drugs, antipsychotic drugs, antiepileptic drugs, and many more. It covers the Pharmacological Management of various diseases, including Alzheimer’s, Parkinsons, Huntington’s disease, and others. Vishal S. Gulecha et al. Elena González Burgos et al. Md. Sahab Uddin, RPh, is a registered pharmacist and a Research Scholar in the Department of Pharmacy at Southeast University, Dhaka, Bangladesh. He has published 75 articles in peer-reviewed international scientific journals in the research field of neuropsychopharmacology and pharmacy. He has also authored several books: Handbook of Research on Critical Examinations of Neurodegenerative Disorders; Pharmakon Comprehensive Pharmaceutical Pharmacology: Tools of Pharmacy: Getting Familiar with the Regular Terms, Words and Abbreviations, and Quality Control of Pharmaceuticals: Compendial Standards and Specifications. Md. Uddin also serves as an editorial and reviewer board member of more than 80 scholarly journals. He has developed Matching Capacity, Dissimilarity Identification and Sense Making tests for the estimation of memory, attention, and cognition, respectively, in humans. He has also established Numeral Finding and Typo Revealing tests for the determination of attention in humans. Md. Sahab Uddin’s interests include neurochemistry that examines how neurochemicals influence the network of neural operation. He has a great interest in analyzing the manipulation of neuronal communication by neurochemicals to manage Alzheimer's disease. Mamunur Rashid, PhD, is a Professor in the Department of Pharmacy at the University of Rajshahi, Rajshahi, Bangladesh, where he also served as Chairman of the department. He previously worked as a visiting scientist at the Department of Pharmacology, Niigata University of Pharmacy and Applied Life Sciences, Japan. He was also the Chairman of the Department of Pharmacy, Southeast University, Bangladesh. He is a member of the Bangladesh Pharmaceutical Society. He also works for the development of the pharmaceutical sector in Bangladesh. He has made a vast contribution to the promotion of pharmacy education and the pharmacy profession to create better opportunities for the Bangladeshi pharmacists. He is one of the pioneers who are working with the Commonwealth Pharmacists Association and the Bangladesh Pharmaceutical Society to develop thospital and community pharmacy in Bangladesh. He has published 75 articles and 23 abstracts in conference proceedings. He is an editorial and reviewer board member for several international peer-reviewed journals. He supervised the research of many PhD, MPhil, and MPharm students. His research fields of interest are pharmacology, neuropharmacology, molecular biology, and cardiology. He obtained his PhD degree from the Department of Pharmacology, Niigata University of Pharmacy and Applied Life Sciences, Japan. After completion of his PhD, he was awarded a postdoctoral research fellowship from the Japan Society for Promotion of Science at the Tohoku University Graduate School of Medicine, Japan.